Interactive Videoinstallation (410 x 270 x 600 cm). A large barbed wire fence confronts the viewer. Behind the fence are plants and some TV monitors. The fence blocks the way to the plants so that no physical contact with the other side is possible. The spectator can only look at the plants through the barbed wire. 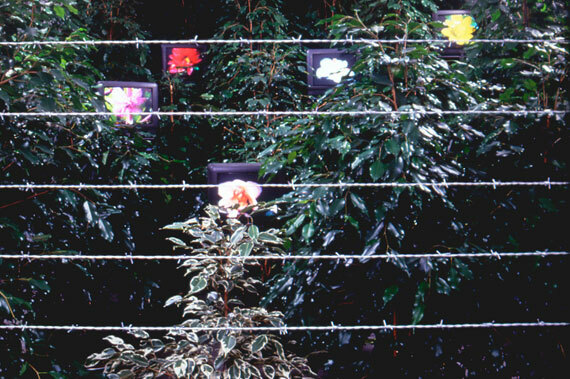 When the viewer comes close to the fence and touches it, he will find out that the barbed wires also function like the strings of a harp, each producing a different note. This activates the monitors so that flowers appear. The flowers open and close as if they breathe on the sounds of the strings. By touching the strings the garden shows its secret flowers. When the viewer stops playing the wires the flowers disappear.